This African safari lodge overlooks the Kings Pool Lagoon and the Linyati River and features 125 000 hectares of unspoilt wilderness. 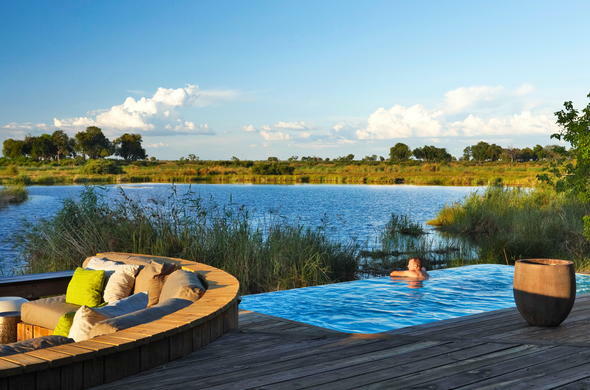 This African safari lodge in Botswana is located within a private reserve in the Linyati area, and borders the western boundary of the Chobe National Park. This safari lodge in Botswana overlooks the Kings Pool Lagoon and the Linyati River and features 125 000 hectares of unspoilt wilderness. Its habitat consists of a mixture of open grassland, riverine forest, mixed Terminalia and Mopane savannas. Guests at this safari lodge in Botswana are accommodated in 9 luxurious and exclusive tented rooms, all with en suite facilities. The raised deck offers breathtaking views of the Kings Pool Lagoon, a waterway rich in birdlife. Hippos, Crocodile, Bushbuck, Impala, Elephant and Sable are also known to frequent this area. Activities at this Africa lodge are not limited to the rules of the Chobe National Park. Game drives in open 4X4 safari vehicles, night game drives and nature walks with experienced guides are just some of the exciting activities available at this safari lodge in Botswana. This Africa lodge also boasts a double-decker boat which cruises the Linyati River and offers wonderful opportunities for game and bird viewing. There are a number of excellent hides littered across the area for guests to enjoy some peaceful wildlife sightings.